To get started, visit our Quick Start Guide. Find additional tips and tricks in our User Guide. KioWare kiosk software wraps around existing browser-based applications, securing the OS and browser, and allowing users to access only your application. Take advantage of downloading a free 500-hour demo and configure KioWare to meet your specific needs. Our demo programs are fully functioning with only a demo banner displayed at the bottom of the screen. Purchasing will provide you with a key that licenses the software - no reinstallation is required. Not sure which product to download? Check out our Product Comparison page. 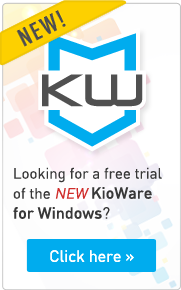 KioWare for Android turns your tablet into a secure kiosk with Single App Mode & Browser Lockdown. KioWare for Windows supports the Chromium browser engine, the same engine used by Google Chrome. KioWare Kiosk Management provides remote management of kiosks with a browser based server console. 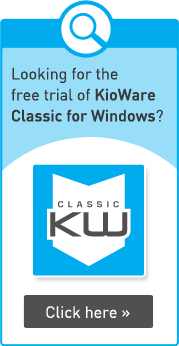 KioWare Classic for Windows supports the Internet Explorer browser engine & a plethora of external devices. Please wait while Codezilla chomps on your credentials.